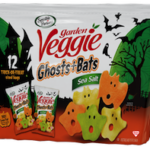 If you’re looking for allergen free Halloween Treats you can share with your child’s class, we have a few for you to consider. It can be hard to find treats that are free of all the major allergens, but when it comes to sharing with classmates, you don’t want anyone to be left out. Luckily, this year there are some fun options available! Sweets Indeed has packaged various forms of candy in vials with Halloween themed names. The vials come in packs of 12. Some are a mixture of liquid and pellet candies. Some have crystals and powder. All of them look like great fun! At this moment, it’s less expensive to purchase these items from Amazon than it is direct from Sweets. 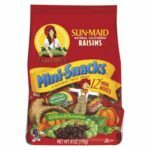 A 12 pack is $14.95 on Amazon and $19.95 from Sweets. The vials look gruesome and gross just like kids prefer! With sugar, corn syrup, and fructose as the main ingredients, I won’t say these are healthy treats, but few Halloween treats are. The Monster Fun set is comprised of 2 vials of Vampire Blood Black Cherry Liquid Candy, 2 vials of Monster Slime Green Apple Liquid Candy, 2 vials of Witches Potion Grape Liquid Candy, 2 vials of Jack’s Ashes Orange Candy Powder, 2 vials of Devil Dust Strawberry Candy Powder, and 2 vials of Werewolf Dandruff Root Beer Candy Powder. If you choose Ghost Fun, you’ll get 6 vials of Ghost Toot Dust Vanilla Candy Powder plus 6 vials of Ghost Boogers Vanilla Candy Pebbles. Can candy be undead? I guess it can. 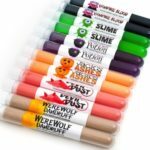 Order Zombie Fun and get 6 vials of Zombie Toot Dust Sour Apple Candy Powder and 6 vials of Zombie Boogers Green Apple Candy Powder. What kid hasn’t eaten boogers? Now it can be a parent sanctioned activity! 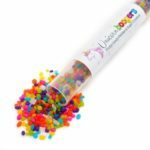 Unicorn Boogers include Fruity Candy Pebbles along with Sugar Crystals. The candy pebbles flavors are key lime, lemonade, watermelon, wild berry, tangerine and blue raspberry. Then there are glimmer white sugar crystals. Apparently Boogers come at a premium. They’re $21.95 for 12 vials from either Sweets or Amazon. Your treats don’t have to come in vials. Zombie Bawlz Chewy Fruit Sours come in a bag filled with Cherry, Watermelon and Green Apple chewy flavors. They’re $10 per bag from Sweets. On Amazon, you can get two bags for that amount of money. If none of these treats appeal to you, Sixlets® offers 3 flavors of gluten-free, nut-free, kosher candies that contain no artificial colors or sweeteners. It should be noted that these candies do contain milk and soy. 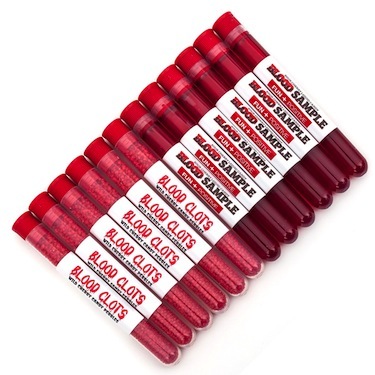 A box of 72 tubes can be purchased from Amazon for $13.07 and is eligible for Prime shipping. Each tube has 23 calories. Choose from Original Sixlets Chocolatey Candies, Chewy Sixlets Fruity Flavored Candies, and Fruity Sixlets Chocolatey Candies. The original flavor features a chocolatey center containing cocoa and carob and a crunchy candy coating. Chewy Sixlets Fruity Flavored Candies come in Lemon, Orange, Cherry, Blue Raspberry, and Green Apple. You can enjoy Fruity Sixlets Chocolatey Candies in Blueberry, Strawberry, Raspberry, Banana, Orange flavor. With Halloween more than a week away, there’s plenty of time to get your treats ordered and delivered in time. Choosing treats with fewer allergens is a thoughtful and kind gesture for you to make to your child’s allergic classmates. Halloween treats don’t have to be candy! 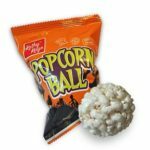 When I was growing up, favorite Halloween treats included caramel apples, candy apples, and popcorn balls. While these are sweet treats, they’re not candy. As we grew to be wary of our neighbors, homemade Halloween treats gave way to packaged candy that could be examined for tampering. Gradually, the packaging shifted from bulk packed candy corn to small individual packages. 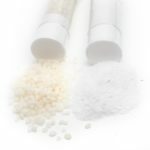 “To help you make informed choices, major allergens including ingredients containing gluten are labeled on foods even when present in small quantities. 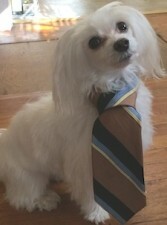 Mars provides a PDF of its Policy on Allergen Labeling: http://www.mms.com/us/legal/allergen.html. These labeling policies make sense, but they also make it more difficult to determine what to let your child eat the minute he comes home with a pail full of individually packaged M&M®s, Nerds®, SweetTARTS®, BUTTERFINGER®, or CRUNCH® bars. 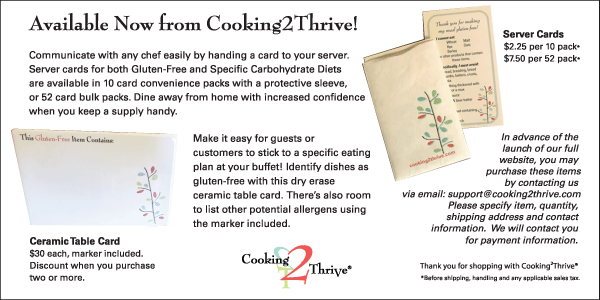 Why not help your gluten-free neighbors and friends enjoy the holiday by providing non-candy treats? I may have mentioned before that some of the most popular Halloween treats I’ve provided haven’t been candy. One year the favorites were pennies and Michael Jackson spiral memo pads. The same kids came back with their friends two and three times that year. The past few years, I’ve mixed packages of KOOL-AID in with candy. Invariably, the KOOL-AID has inspired the most excitement. Non-candy treats stand out as novel and some provide the added benefit of reducing sugar consumption. Halloween Tattoos – My kids always wanted temporary tattoos whether we were at a ballgame, festival, or school event. I’ve also seen popular temporary tattoos at college and senior citizen events. On Halloween, spiders, pumpkins, and witches come in glow-in-the-dark making them even more fun. There’s still time to order from Oriental Trading, Amazon, or Tattoo fun. You can also find tattoos in sheets of 12 at Wal-Mart or Michaels. Get your kids to cut them into singles. It’s a great way for them to help! Even better, order Edgar Allen Poe tattoos from Archie McPhee®. They’re creepy and literary. Halloween Finger Puppets – There’s a large variety of Halloween specific finger puppets on the market. Some are cardboard. Some are plastic. All can inspire your child’s imagination! Available for as little as 9 cents each, these are an easily affordable option. 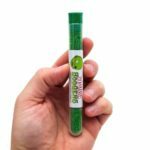 If you’re not on a budget, Archie McPhee scores again with Glow Zombie Finger Puppets at about $1 each sold (sold in package of 5) or Black and White Finger Monsters at about $1.25 each (sold in package of 4). Vampire Fangs – Get some fangs and you’ll be like “True Blood” author, Charlaine Harris who has a custom pair. You can find high end, realistic teeth for you and inexpensive options for the neighborhood kids. Amazon, Oriental Trading Company, or your local Party City should be well-stocked. 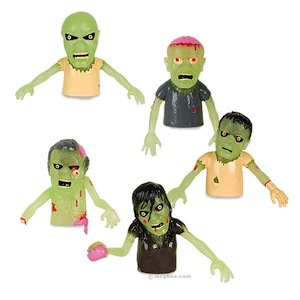 Zombie Figures – Zombies are popular these days for both children and adults, so Zombie figures are easy to find. Some are simple and harken back to the green army men we had as kids. Others are detailed and remind me of HOMIES. Both types are available from Amazon. Witches Fingers – There’s just something irresistible about slipping on a blue finger with a long red fingernail. It makes you feel like you can overpower anything by just pointing at it. You can purchase fingers for your little witches at U.S. Toy Company for about 12 cents per finger. Similar products called Martian Fingers are available from Oriental Trading Company. 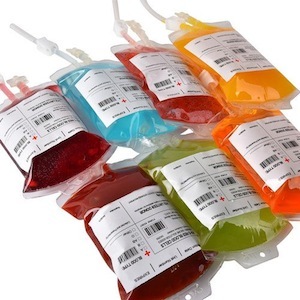 And a bonus: If you’re having a Halloween party, these reusable blood bag drink dispensers are fantastically fun! They hold 11.5 ounces of your favorite soda, juice, beer, wine, or mixed drink and come in packages of 10 for about $20 from Amazlab. Gluten-free moms will appreciate your thoughtfulness in providing non-candy treats! Gluten-free kids will appreciate being able to enjoy your treat immediately without concern. Whatever treats you provide, have fun, be safe, and Happy Halloween! Booooooooo! 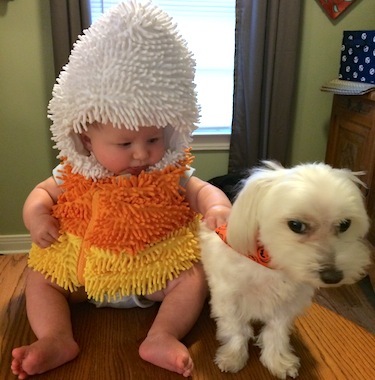 Who…Has Gluten-Free Halloween Candy? Booooooooo! Who…has gluten-free Halloween Candy? 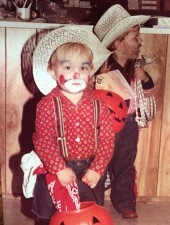 My family loves a Halloween party, Halloween costume, costume in general, party in general, treats in particular and fun…always! 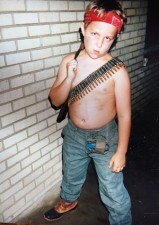 As the holiday approaches, it just so happens that I’ve been digitizing some of my old photos. If you look through a stack, you’d think every day was Halloween at our house. 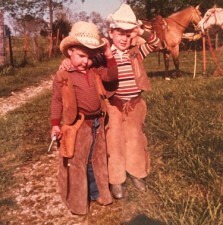 On regular days, Ben and James spent most of their time as cowboys, often in real leather chaps & vests, but sometimes they posed as army men, kings, and alien creatures in cardboard spaceships. 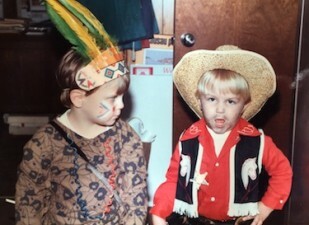 On Halloween the costume parade expanded to feature rodeo clowns, Native Americans, and Rambo. Like the kids in my current neighborhood, the boys loved going door to door extorting candy from our friends. We would start early, stay out late, and then gleefully sort through the candy haul. Of course, way back then none of us worried about gluten in the candy; all we had to fear was the mythical razor blade. Now we’re very gluten conscious. Every year, I review the information available from the Hershey’s, Jelly Belly, Just Born, Mars, NECCO, Nestle, Sweets and Tootsie Roll websites to make sure that items on the following list are still gluten-free. The past two years, all of the sites have been helpful. 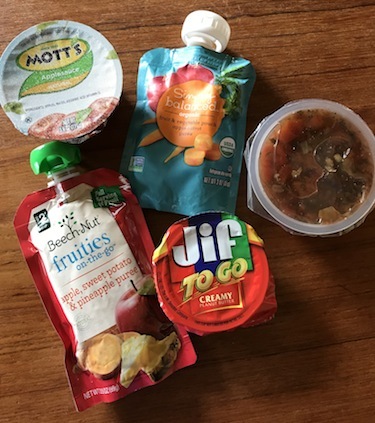 This year, there’s a change at Mars where the consumer is encouraged to read labels, and Nestle which vaguely talks about being responsive to the public’s request for gluten-free options. I agree with Mars that reading labels is important, but in the dark, in a mask, on someone else’s porch may not be the best time to expect a child to read. And once the kids come home with a plastic pumpkin full of candy, you’re not going to want to take the time to read labels either. Besides that, the special Halloween candy bars may not contain all the information on each individual package. To prepare your children in advance so they can selectively grab from a candy tray, use the following list which contains candy identified as gluten-free by its manufacturer. Candies packaged by Sweets, but not made by Sweets. Read labels. All Tootsie Rolls and Charms products with the exception of Andes cookies. There are enough choices to ensure your gluten-free kid can get a sugar high before the night is over so put the finishing touches on your costume and head out for some fun! 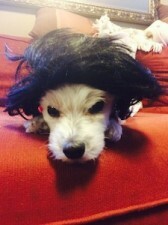 Stewart can’t decide if he wants to be a bidnessman or Elvis. Which do you think he should be?